Thanks for letting me share~have a great day! 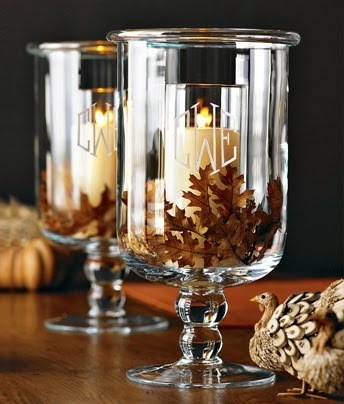 Love your fall decoration! (do you know your link at Rhoda's doesn't work?). Hey, Melissa, got your first link deleted. Thanks for joining the party! I love all your pretty things sprinkled around your house. I just can't seem to do much for Fall decor, but look out come Christmas. Those metallic pumpkins on the top pic are SO cool! I love your use of twine. Love the candle in the lantern! Your touches are so homey and cozy. Looking like fall around there! Love it all! 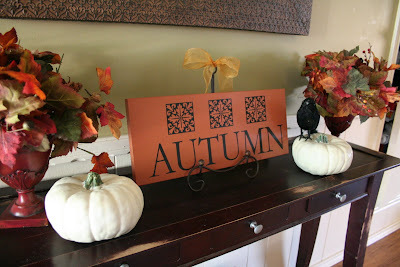 Your fall decor is beautiful!! I am loving those metalic pumpkins! Everything looks so great Melissa. I love it all. I'm wondering, though, what those little bitty pumpkin looking things with the candle are. Whatever they are, I want some! Love all your little vignettes! Just the right amount of Fall touches! GORG! Did buy those first pumpkins like that? They are so pretty! Very pretty! Love the lantern filled with berries and the shimmery pumpkins. I can feel myself getting in the mood for fall--finally! 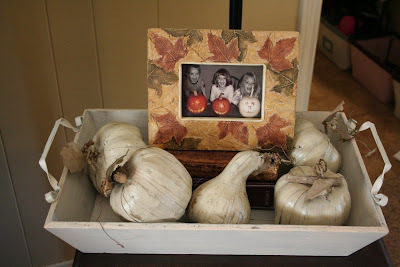 I also have those cute mini pumpkins or Putka pods as they are called. 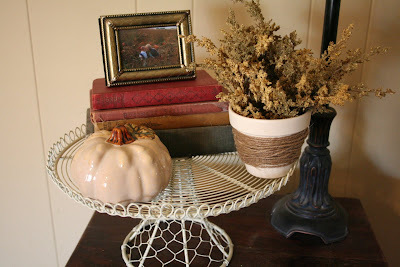 I love using them amid my other fall decor items. Your home is so beautiful!!! Love the fall decor. Love all your ideas!! 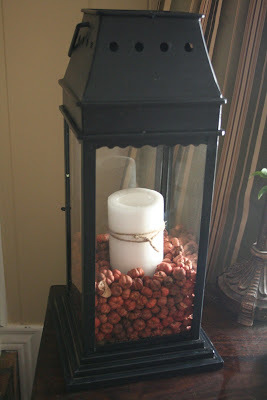 I especially like how you filled your lantern with fun things!! I must do that one for sure. The miniature pumpkins in the lantern: I got them at Target last year on clearance. (or maybe 2 yrs ago??) They are just miniature pumpkin bowl fillers around their candle section~they may have them this year again. good luck! The metallic pumpkins were from Target 75% clearance last year.. I just love the tray with your kids' picture in it! You have such a lovely home. 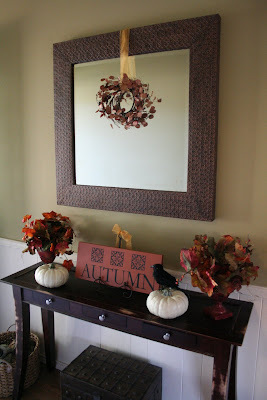 I love how you have decorated for fall, so simply and keeping with the style of your rooms. Just love it!! I love your pumpkin pods in your lantern. Your home is so cute and cozy. Thanks for sharing! Oh how I LOVE fall! Here in AZ it was our first day under 100 degrees - so it still feels like summer but I'm hopeful for cooler weather coming soon :) Pumpkins make me HAPPY! I love your Fall decor, especially your Autumn sign. I love the color. 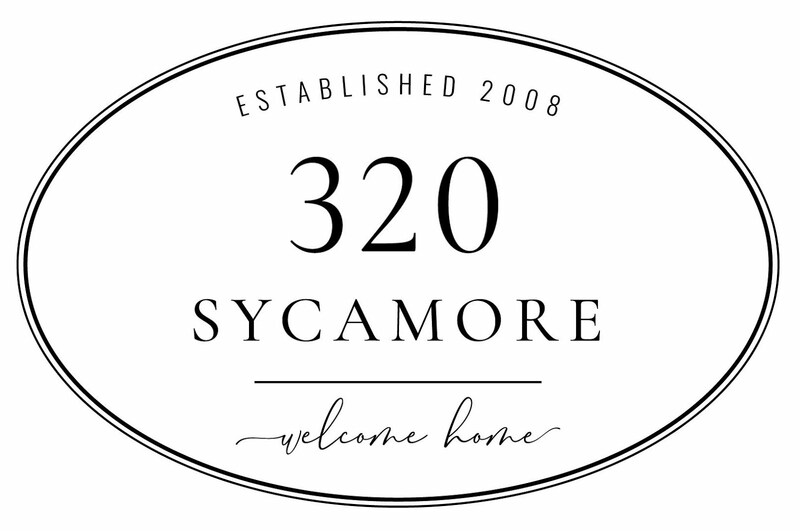 Thanks for sharing your home with us. So so pretty! I love the color of those pumpkins and that Autumn sign. Everything is so beautiful! Everything looks so festive - I love it, Melissa! Hello sweet Melissa - lovin' all your Fall decor! 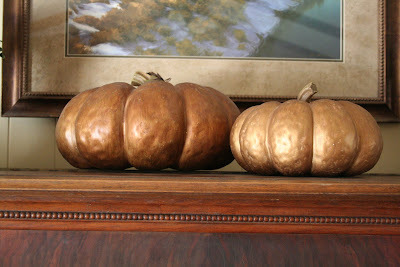 I especially think those metallic pumpkins are fabulous! Haven't seen anything like that before. So unique and special. Thank you for sharing! I really adore your Fall entryway. Lovely touches throughout. Your autumn decor is beautiful! 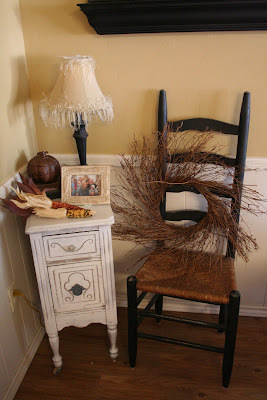 I especially like the wreath in the ladder back chair. I have one just like it and had never thought to do that. Thanks for sharing! Very pretty, love the wreath hanging in front of the mirror. Nice touches! So pretty! This is so inspiring, I need to work harder on my home for the fall. What great ideas! Love those painted pumpkins. I got some yesterday and plan on making them up tomorrow. Loving, loveing, loving this! 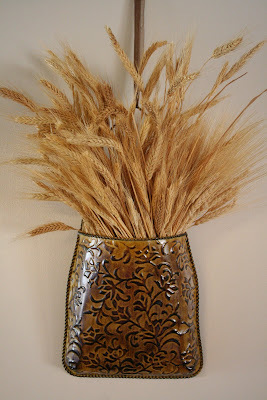 I have to find some wheat for my iron basket. It's perfect. Hey Melissa! I have been so far behind on my blogging so I am playing a bit of catch up. It looks like yardsale season has been good to you. I just know everything you found will be fabulous given a little TLC. Love the new outdoor rug and that red bench is fantastic!